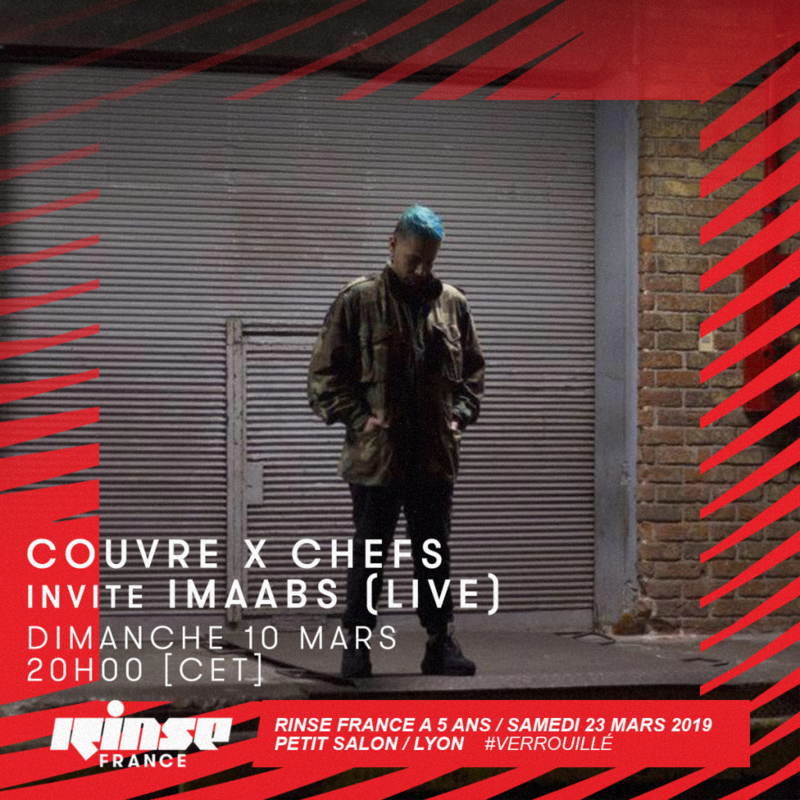 On March 10, we were lucky to have Chilean producer Imaabs in Paris and could invite him to our show on Rinse France. After having already received him in June 2017 for a legendary B2B with Zutzut, Imaabs has this time made his live act that he has been working for some time. The career of Imaabs is not to present. His releases on the Chilean label Diamante Records, then on international labels such as Trax Couture (UK), NAAFI (MX) several times or PTP (fka Purple Tape Pedigree, US), various world tours, presentations in the prestigious festivals like Mutek Mexico, Warm Up (MOMA PS1), Sónar Barcelona … make him a key member of the current world club scene. Pushing ever further the boundaries between music clearly thought for dancefloor and sound experimentation, the music of Imaabs is a complex and extremely rich and interesting work, like his first self-produced album Discretización, released in 2018. On the occasion of the realization of his live act in the studio of Rinse France, we took the opportunity to ask him some questions about this exercise. How did you start the conception of your live act? It was born when I was offered to do it for Mutek Mexico. In fact, for any reason, I managed to get a Maschine Studio from Native Instruments thanks to NAAFI, I think it is important to mention it. From there, I started to develop my live act, without neglecting the complementation with the DJ set. I’m a defender that many DJ’s make music at the moment, it’s not just mixing two songs … they’re thinking and doing much more, and having beat machines or even some live DAW makes the process more interesting. That’s what I did that in Mutek, and in Sonar Barcelona with Zutzut, but for that time it was only very minimal, we decided not to experiment and improvise so much and try to be seductive with the audience. Como emprendiste la concepción de tu live act? Nació cuando me ofrecieron hacerlo para Mutek México, de hecho por esa razón logré conseguir por colaboración una Maschine Studio de Native Instruments gracias a NAAFI, creo que es importante mencionarlo, desde ahí empecé a desarrollar sin dejar de lado la complementación con el dj set, de algún modo soy defensor de que muchos Dj’s hacen música en el momento, no es sólo mezclar dos canciones… están pensando y haciendo mucho más, y contar con maquinas de ritmo o incluso algún DAW en vivo vuelve más interesante el proceso; hice eso en Mutek, y en Sonar Barcelona junto a Zutzut, pero para esa vez solo fue muy mínimo, decidimos no experimentar e improvisar tanto y tratar de ser seductores con la audiencia. What are the differences between your live act and your DJ set? In a workshop that Uwe Schimdt did in Santiago, he explained how the live act with Tobias was mostly improvisation, that many times they did not know what would happen, what they would do, but that there was minimal coordination, a kind of complicity. They knew what to do in the next moment, a little guiding in the intuition. I think the main element of the live is that: more intuitive or even improvised. The ideal is to create the plane where to move, it is a map or cartography of movements where it is easy to maintain something or radically change. It is very diagrammatic. Sometimes there are DJ sets that become interesting because that happens. You open yourself to a broader horizon of freedom; even so, I think the radical difference between my live act and the DJ set is the experimentation. At least mentally and corporately, it gives me more freedom to decide and empower myself of what I want the audience to listen to. The DJ set is usually aimed at the party, it is more collective and democratic; the live act is perhaps more of an installation of art, it is thought to make the people enter in my world to the hearing. I still feel that both points can be complemented and it is something like what I did in Rinse. Cuales son las diferencias entre tu live act et tu DJ set? En un workshop que hizo Uwe Schimdt en Santiago, él explicaba como el live act junto a Tobias era más que nada improvisación, que muchas veces no sabían que pasaría, ni que harían, pero que existía una coordinación minima, una especie de complicidad, sabían que hacer en el siguiente momento, un poco guiándose en la intuición. Creo que el elemento principal del live es eso, más intuitivo o incluso improvisado, lo ideal es crear el plano donde moverse, es un mapa o una cartografía de movimientos donde sea fácil mantener algo o radicalmente cambiar; es muy diagramático. A veces hay dj sets que se vuelven interesantes porque justamente pasa eso, te abres a un horizonte de libertad más amplia; aun así, creo que la diferencia radical entre mi live y el dj set es la experimentación; al menos mental y corporalmente me da más libertad de decidir y empoderarme de lo que quiero que escuchen; el dj set por lo general está dirigido a la fiesta, es más colectivo y democrático; el live act es quizás más una instalación de arte, está pensado para hacer entrar en mi mundo a la audiencia; aun así siento que ambos puntos puede complementarse y es algo así lo que hice en Rinse. Which side of your work allows you to explore your live act? I think there is a part of my work that is more directed to try to think or perhaps diagram perceptive processes, I do not know how to explain it. It is when I do not want to think about the body, maybe only nerve terminals, ideas, frequencies, etc … even so, I always end up bursting something in the body or in some movement. I have those gaps that in almost all my tracks are, but in my live act, I put them more forward. Qué lado de tu trabajo te permite explorar tu live act? Creo que hay una parte de mi trabajo que está más dirigido a tratar de pensar o quizás diagramar procesos perceptivos, no sé como explicarlo, pero es cuando no quiero pensar en el cuerpo, quizás solo quedan terminales nerviosas, ideas, frecuencias, etc… aun así siempre termino reventando algo en el cuerpo o en algún movimiento; pero dejo esas lagunas que en casi todos mis tracks están, solo que aquí las pienso en extenso. For now only Maschine and CDJ’s. I always ask for the Pioneer DJM900 for the audio outputs and effects too. I want to complement with an Elektron Octatrack, but I have not yet managed to raise the money to buy it, it is a bit expensive. Por ahora sólo Maschine y CDJ’s, siempre pido el Pioneer DJM900 por las salidas de audio y los efectos; quiero complementar con una Elektron Octatrack, pero aun no he logrado juntar el dinero para comprarla, es un poco costosa. I want to improve my live act, try to make it more consistent, work with a team and move in festivals, maybe do something special from there and release music on a French label, derive a bit of my name, style and so on. Maybe something more techno and industrial would be more with what I’m doing now … I have an EP for NAAFI almost ready for this year, and maybe from there look for other labels as Imaabs … I’m also presenting myself with a play called Peso Muerto, by Carolina Cifras. We premiered it in Dañsfabrik in Brest, but next year we want to present it more times, it is not yet the final version and I want to see how to better develop the sound and music of the play. I would like to produce music for dance, theatre, even cinema. Quiero lograr mejorar mi live act, tratar de hacerlo más consistente, trabajar con un equipo y moverme en festivales, quizás hacer algo especial desde ahí y sacar en algún sello francés, ir derivando un poco de mi nombre, el estilo y así; quizás algo más techno e industrial estaría más de la mano de lo que estoy desarrollando… Tengo un EP para NAAFI casi listo para este año, y quizás de ahí buscar otros sello como Imaabs… También me estoy presentando con una obra llamada Peso Muerto, de Carolina Cifras; la estrenamos en Dañsfabrik en Brest, pero el próximo año queremos presentarla más veces, aun no es la versión totalmente final y quiero ver como ir desarrollando de mejor manera el sonido y la música de la obra. Me gustaría desarrollar música para danza, teatro, incluso cine. March 29th : Couvre x Chefs présente Couvre x Feu w/ Stranacorpus, 9b (Paris).